Printer of Amsterdam at the end of the seventeenth and the beginning of the eighteenth century. His activity as a typesetter, publisher, author, and translator extends from 1680 to 1724. He worked successively in the printing establishments of David Tartas, of Moses Mendez, and of Asher Anshel & Co. He edited in 1690 a Judæo-German translation of Manasseh b. Israel's "Miḳweh Yisrael," and of the "Masse'ot Binyamin" (Itinerary of Benjamin of Tudela). He published the following works: in 1706, his own "Leb Ḥakamim" containing a treatise on morals, together with the ethical work "Leb Ṭob," by Isaac b. Eliakim of Posen, both in Judæo-German; in 1711, a new edition of the "Ẓe'enah u-Re'enah"; in 1718, a calendar for the year 5479 (=1719); and in 1722, Isaac Aboab's "Menorat ha-Ma'or," with the Judæo-German translation of Moses Frankfurter, which Frankfurter himself revised. 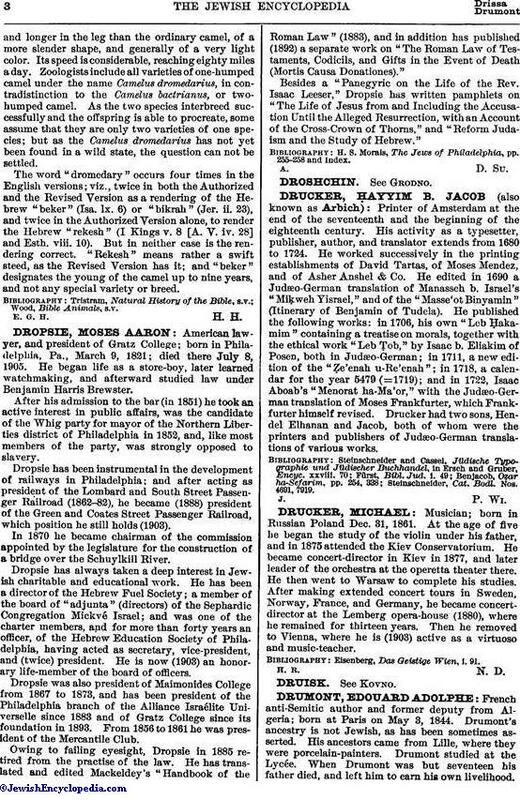 Drucker had two sons, Hendel Elhanan and Jacob, both of whom were the printers and publishers of Judæo-German translations of various works. Steinschneider, Cat. Bodl. Nos. 4691, 7919.